Personal, flexible, trendy. Every person loving style, desires in his own home a walk-in closet: an intimate and modular room, able to transform practicality into pure emotion. Francesco Pasi knows it very well, and in the preview of the brand new Collection Ellipse, exposed at the Salone del Mobile 2018, presented an hyper-equipped walk-in closet with a modern and luminous design. A proper room dedicated to luxury living, perfect to combine wardrobe functionality and individual aesthetic taste satisfaction, thanks to the endless possibilities of personalization through various wood essences, colors and accessories. Special hangers for trousers, removable shoes holder with Blum cushioned closing mechanism, mirrors and shelves illuminated by dimmable Led lights, drawers for jewels and belts/neckties compartments upholstered in Nubuck leather give unicity and preciousness to the walk-in closet by Francesco Pasi. The new Collection Ellipse brings design to another level, connecting contemporary and chic mood: that’s the reason why the walk-in closet becomes not only a container for clothes and accessories but a real creative inspiration, according to a refined “total home” proposal. The decorative elements that exalt the precious woods such as rosewood and walnut are available in several chromatic nuances matt and glossy like chrome, gold and nickel. Space to imagination in which order and practicality are the protagonists, without missing a refined aesthetics, where every object find its own place and every need becomes reality. 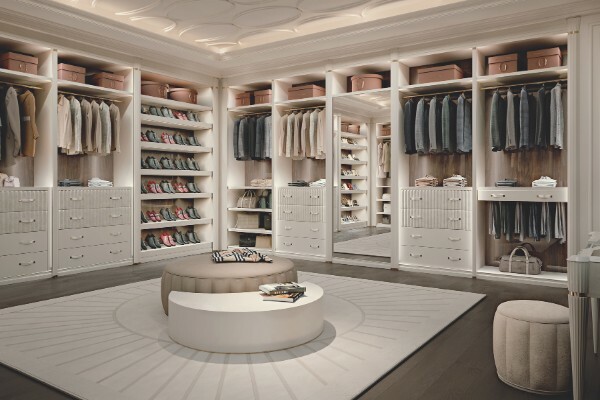 “The walk-in closet from collection Ellipse is not only a further room inside a house” said Francesco Pasi, owner of the company. “Our purpose is to realize a customized room able to satisfy the wellness of our customer, an area inside the house where to pass the time, connecting the exigence of order and space with the desire of unicity”.